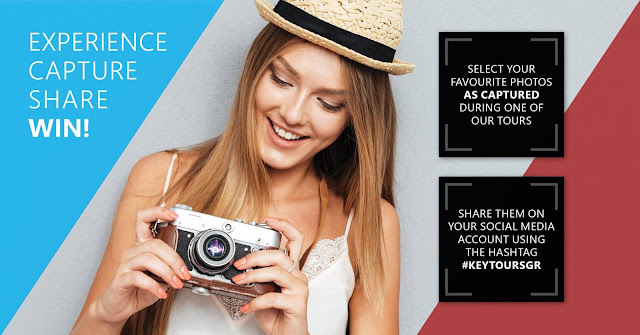 KeyTours: Experience, Capture - Share, Win! Experience, Capture - Share, Win! Let the Greek landmark quest begin! Experience them up close and personal, capture their essence in a frame, share them with our social media contest hashtag, and become a winner! Greece is a culturally rich country, with a tremendous amount of ancient landmarks each physically representing the greatness of past eras. The ancient Greeks were prolific in building monuments all around Greece that are charged with cultural, political and even spiritual significance. What this means is that each landmark is bound to evoke feelings of awe and fascination, as you become immersed in the story of each ancient structure you come across. Most of these ancient monuments live still, having survived centuries of conquests and wear and tear, reminding us of the civilisations that came before us. Today, these landmarks stand proudly although weathered, waiting to be discovered by this generation, and hoping to transcend their message of elegant perennialism to the entire world. At KeyTours we give you the opportunity to explore them all, in Athens and all over Greece, discovering them one by one, and thus unraveling the fascination of Greece, step by step. And, we are counting on your photos to show the splendor of Greece to the entire world! If you have experienced one of our tours since the beginning of 2016 until today, we want to know about it! Photos you have already posted in the past, must be re-posted anew to your account with our competition hashtag #KeytoursGR, in order to be considered valid entries! Please read the competition’s Terms & Conditions. We wish you happy exploring, and remember: experience, capture, share & WIN!